Do You Have Your Holiday Emergency Essentials Kit Ready? November has flown by. It’s hard to believe that it’s time for Thanksgiving already. As my turkey sits in the fridge defrosting, I’m scrambling around in an attempt to get everything ready for the holiday. As I was making my to-do list, my mind kept going blank and I kept feeling like I was forgetting something important. So I decided to go online to see if I could find a Thanksgiving essentials checklist and I came across this great one by This Mama Loves. It’s not a checklist for the turkey or the trimmings but rather a checklist for the fixings-fixing of emergencies that is. 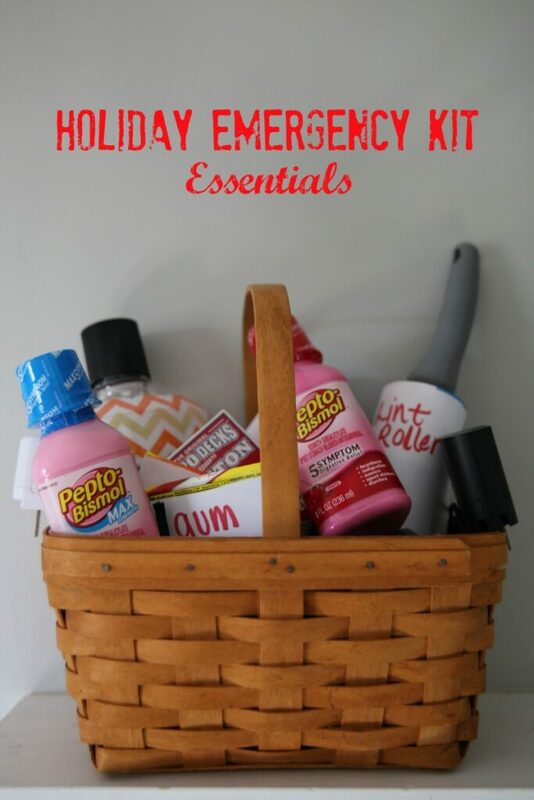 This Mama Loves created this must have Holiday Emergency Kit Essentials. This kit includes almost everything you need to survive the holiday; Pepto, gum, a lint roller, etc. Check out This Mama Loves’ “How to Avoid a Holiday Disaster: Thanksgiving 911” post for all the holiday essentials needed to make it through the day. Her smart ideas will help you to think of everything you may need ahead of time.